We only caught this one at the very last minute. 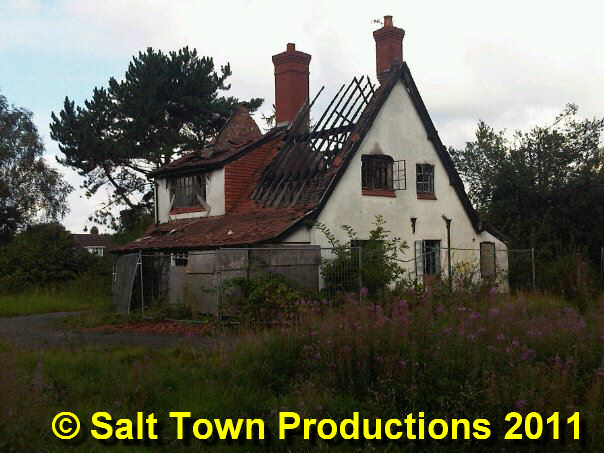 Less than a week after our photo was taken this derelict house in Nantwich Road was reduced to a pile of rubble. It stood just a few yards away from the aqueduct, and at the very top of the unadopted road which runs along the top of the steep embankment above the roadway and provides access to the houses which adjoin the school playing fields. It could also be seen from the top end of Hannah's Walk, near the point where it joins the canal towpath, and from the towpath itself. It lay derelict for many years, with its garden very overgrown and, as can be seen from the photo, was vandalised and eventually gutted by fire. I noticed that something was happening in the middle of September. Workmen were on site clearing the dense vegetation and building bonfires to burn it and some of the remaining timber from the house. I took the above photo and, the next time I was in the area the bulldozers were on site and had knocked the house down, leaving only a pile of rubble. Passers by who were watching the demolition told me that they'd heard that local builder Andy Clarke had bought the house and land. No doubt quite soon a new house and garden will occupy this spot*. In the meantime, does anyone know anything of the history of this house? From its location, and from the style of the house, it must have been a luxurious home in its day. 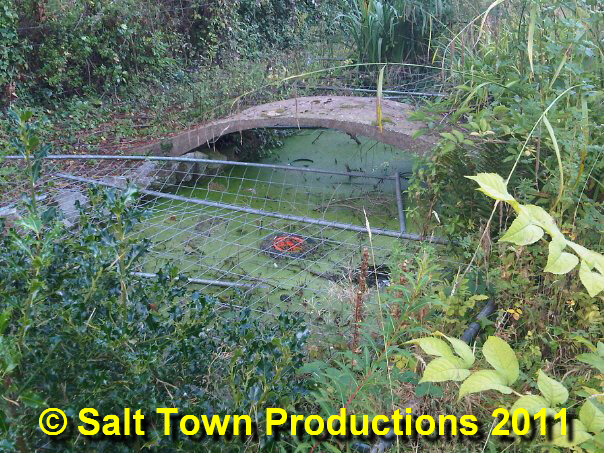 The photograph below shows what appears to have been a fishpond, complete with rustic bridge, in what remains of the garden; a testament to happier times and better days. Stephen Koralski We used to go in there as teenagers and the electricity still worked. It was where I met a lot of friends - shame on who ever burnt it down,it was a nice place! UPDATE: As can be seen from the above FB Feedback, Andy Clarke sold the land on and a planning application was made in 2018 for the six houses on the site. This was refused because of problems over access (proposals were made to cut an access road into the bank below the houses on Nantwich Road, which would have been practically impossible to build and to use. The site was put up for auction in December 2018. This house was built & owned by my Great Uncle Gordon Nicholls who lived there with his wife Mary, Gordon's brother, Frank Nicholls (my grandfather) lived on the opposite side of Nantwich Road, in a house called "Greenroofs". They both worked at Foden's factory in Sandbach. THE FOUNTAIN FIELDS PADDLING POOL, EARLY 1970s.